Beginning tomorrow May 11th, T-Mobile is dropping some prices with the T-Mobile G2, Nokia Astound and T-Mobile myTouch 3G Slide all receiving price breaks. 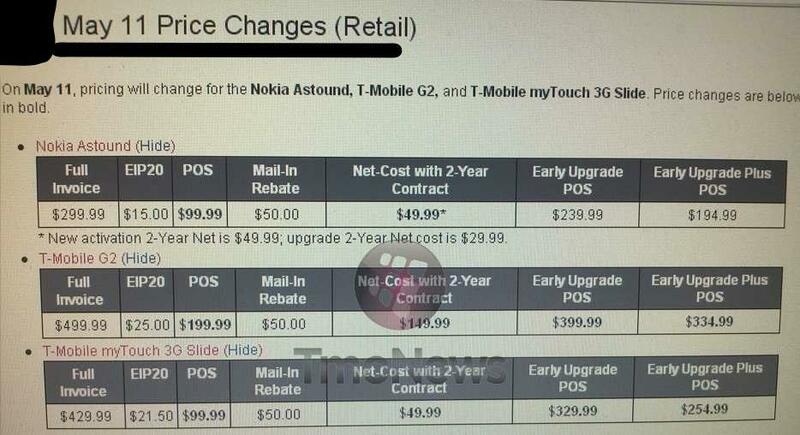 The T-Mobile G2 is dropping from $249.99 before rebate to $199.99 before a $50 mail in rebate. The Nokia Astound will drop to a net-cost of $49.99 after a $50 mail in rebate. Last but not least is the T-Mobile myTouch 3G Slide (which is currently free online) to $49.99 after a $50 mail in rebate. That is all. Oh Streamline/Quickview. I love that some customers would rather NOT save the money and order the phone through customer care. Remember people, if a rep tells you that you should log in to your account and get it there to save some money – DO IT. These prices are pretty darn cool. I’d probably get one of those phones if I didn’t already have a Galaxy S and WP7 already. The G2 and myTouch Slide are still way cheaper on Amazon Wireless. In fact, for any phone Amazon carries that’s true about 99.9% of the time. Not bad for pricing… especially for the Nokia (49.99 for new activation, 29.99 for upgrades…) Would be great phones for my parents since it has a FFC, but I want to get the next iPhone lol. Can you avoid having to buy a data plan if you buy the nokia on t-mobile’s web site? will rebate still qualify? nice phone, but i don’t need a data plan. Can anyone “in the know” about these things explain what qualifies someone for ‘Early Upgrade’ and ‘Early Upgrade Plus’? I assume it’s similar to a partial upgrade at an unspecified time after using a full upgrade but how much time must elapse until each of those points is hit? This is is absolutely correct.. Does this mean if I just purchased the G2x only a couple of weeks ago, that I can get a credit for the difference? Does anyone know? You can return most phones in most states within 14 days. If you’re able to do that, you could save some change. Do you do that when you buy other electronics? No… you dont get credit for it. The original price is not changed. What is the EIP2O column? $50 for the Astound is a steal! This is an awesome phone, and well worth the price. The only better deal I’ve seen is WalMart sellingthe phone rebate free for $30. Two-year contract, every phone should be free!